Jay Lake's previous book, Mainspring (2007), to which this is a sequel of sorts, was to my mind a deeply, almost fatally, flawed novel; and the flaw was God. It introduced a beautifully realised world in which the universe was exactly like an old-fashioned orrery: clasped around the Earth's equator is an immense brass cog wheel which controls our movement through the network of tracks that criss-cross the heavens. Such a mechanistic situation inevitably raises questions about free will and determinism, about the nature of a clockmaker God. Unfortunately, Lake pre-empted all such questions by making God into an active player in his drama. In the very first scene our hero, Hethor, is visited by an angel, an archetypal heavenly messenger all wings and light who gives the unlikely hero a direct commission from God. Thereafter, whenever Hethor's quest flags, God carefully drops a literal plot coupon at his feet. The insidious character of that flaw is revealed in this second and much better volume. It is two years after Hethor's quest and he has now disappeared from view. The novel instead follows the adventures of three other characters, two of whom had some slight acquaintance with Hethor in the previous novel. The novel again is a picaresque tale, and Lake's characters are restless, never staying long in one place and covering vast tracts of the Northern hemisphere. But where Hethor's journey was a personal quest interrupted by a constant succession of battles and hairs-breadth escapes, the various intersecting journeys of Paolina, al-Wazir, and Childress bring them into the orbit of vast geopolitical conspiracies. The two great empires that dominate this world (the date is 1902, but though some of the broad political structures resemble our own history, the equatorial Wall, from which the cogs emerge, has inevitably resulted in many differences) are Victorian Britain and Imperial China, and now they are coming into serious conflict. But behind these two great political entities there are two world-spanning secret societies: the spiritual order of the white bird and the rationalists of the Silent Order. These two conspiracies are theoretically at odds with each other, but pragmatically there are connections and collaborations between the two, and it is their machinations that lie behind the growing conflict between Britain and China. What divides the white bird and the Silent Order is the philosophical question of the existence and nature of God. When you can actually see the mechanical workings of the world arching over the night sky, these disputes become more urgent, more fundamental to any understanding of the world, than ever the petty differences between Protestantism and Catholicism in our world. When you add in the very different philosophical take on things that grows out of Chinese tradition, it is easy to see that debates about the role of God in making or running the world form an intellectual underpinning to this whole novel. And fascinating the debates are, too. Or they would be, if those of us who have read the first novel didn't already know the answers, because we've seen God in action. Unless he's going to spring some surprise in a later volume (God is really a time-travelling alien with clock-making hobby), Lake has already pretty much killed off one of the most intellectually satisfying parts of his whole sequence. What we are left with, however, is much richer than the boy's own adventure of Mainspring . The title is telling. Just as Mainspring introduced us to the clockwork universe that is the mainspring of the sequence, so Escapement , which refers to that part of a mechanism which checks and releases the motive power, is a novel which constantly alternates between escape and control. In a world in which the opposition of free will and determinism is made visible, the eternal and eternally thwarted quest of our three protagonists for ways of taking control of their own lives reproduces in their adventures the overarching motive power of the sequence. Of the three, the most interesting if least believable character is Paolina. She is a mechanical genius brought up in a remote and tiny community clinging to the foot of the Wall, but though her machines are relied on by the lazy men of the village, the fact that she is a girl denies her all rights and freedoms. When a survivor from the airship in which Hethor served turns up in the village she learns about the outside world and begins to long for escape. The crisis comes when she accepts the gift of a watch from the survivor. The men are angered—such treasure should automatically come to them—and she is imprisoned in a darkened room. There, without light, with no specialist equipment, and based solely on her memory of having seen the workings of the watch just once, she recreates it. I had enough of a problem with this on its own, but when the watch subsequently turned out to have devastating magical properties, I lost my faith in Paolina completely. 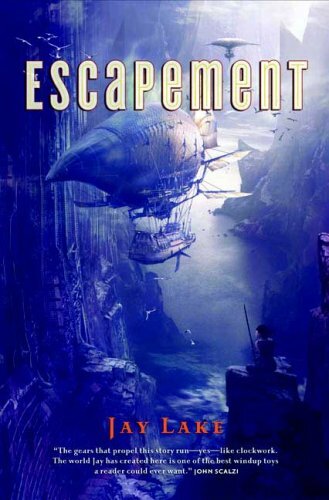 Nevertheless, when she finally leaves the village to make her hazardous way along the foot of the Wall to Africa, where she falls in with al-Wazir, takes an airship to Europe where she almost falls into the clutches of the Silent Order, then has to make a long and hazardous journey back to Africa, Paolina's story still includes a string of fascinating and revealing vignettes that oppose her feminine quest for freedom against a masculine urge for order in a deterministic society. There is a similar dynamic, repeated swings between freedom and control, in the story of Childress. She was the librarian who first set Hethor on his way, but now she is summoned by the order of the white bird, who seem about to sacrifice her to the Silent Order. But at the last minute the ship on which she is travelling is attacked by a Chinese submarine, and she is seized in the mistaken belief that she is a ‘Mask,' a senior figure in the order of the white bird. She is then taken under the Arctic ice to China, and then on south to where the Chinese are investigating a newly discovered archive for clues on how they might get beyond the Wall. The third and by some way the least interesting of the three intersecting stories is that of al-Wazir, whose main role in the novel seems to be being shifted by authorial dictat from pillar to post in order to meet up at crucial moments with, first, Paolina and then, climactically, with Childress. He was, so far as the authorities know, the sole survivor of the crew on Hethor's airship, but avoids court martial when he is sent with a British expedition to dig a tunnel under the Wall. Lake spends a lot of time setting up the mad German inventor with his massive tunnelling machine that al-Wazir has to protect, but as soon as the British encampment is attacked the whole lunatic enterprise is simply forgotten as we follow al-Wazir and his companion, a metal man named Boaz, on a series of dangerous adventures. Quite often, Lake seems to set up situations that look as if they are going to become a significant part of the plot, only to forget them again. It is as if such plot elements—alongside the tunnel under the wall we have the city of the brass men, the political divisions within the Chinese hierarchy, the amazing clock in Strasbourg, the lost archive—would require the story to stay still in one place if they were to be properly explored, and Lake simply cannot stay still. Other than the submarine on which Childress travels and the encampment where the tunnel is begun, I don't think there is a single setting which receives the attention of more than a dozen pages of the novel. The effect is rather breathless. Somewhere in all this there is a complex, fascinating and richly rewarding novel, but it seems that it can only be told at high speed. Still, it is obvious that Jay Lake has devised a world that can sustain any number of future stories. Certainly what we have read so far barely skims the surface of the moral and religious issues thrown up by the setting, and if future novels are going to improve at the rate we have witnessed in these first two, then they are going to be rewarding in the extreme. All we ask is that Lake harness his penchant for boys' own plotting and slow down enough for us to look around and see more of the curiosities this world creates.